Yasooka at the height of his Magic career. Yasooka Shouta is a professional Magic: The Gathering player who made his first and only appearance as a cardfighter in the Sendai regional competition, contending with two other finalists. He placed third in the regional, using a swarm-based Royal Paladin deck. 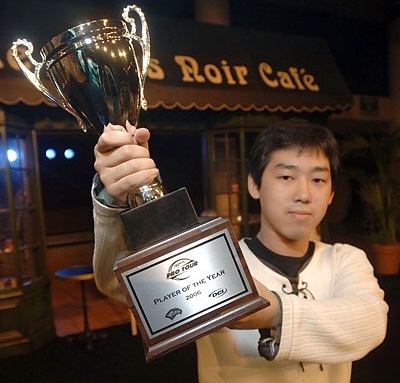 Yasooka is primarily known for his success in the Magic 2006 Pro Tour season, in which he was declared Pro Player of the year. He has played over 2500 Magic: The Gathering matches, and currently resides in Shinjuku. Similar to his other opponents at the time, Yasooka's deck is a Barcgal superior ride build, but rather than being grounded in Alfred like Gotou or Soul Saver Dragon as with Murakami, his centerpiece is Gigantic Charger. His intended vanguard is clearly pinned as Lohengrin or Soul Saver Dragon, but Charger is the deck's main feature in that it immediately and unavoidably fills the field. It comes as a curiosity then, that Yasooka chose not run even a single copy of the King of Knights--his strategy could be broken down into riding from Lohengrin and Soul Saver Dragon, having arranged his field for her Holy Charging Roar beforehand with Charger. 1. "2006 Player of the Year Race: Event Coverage: Daily MTG." Magic: The Gathering. Wizards of the Coast, 13 Dec. 2006. Web. 30 Mar. 2012. <http://www.wizards.com/magic/magazine/Events.aspx?x=protour/standings/poy06>.